In the fall of 2012, I became a stay at home mom who homeschooled 3 of my 4 children. I really felt alone and needed some major encouragement. 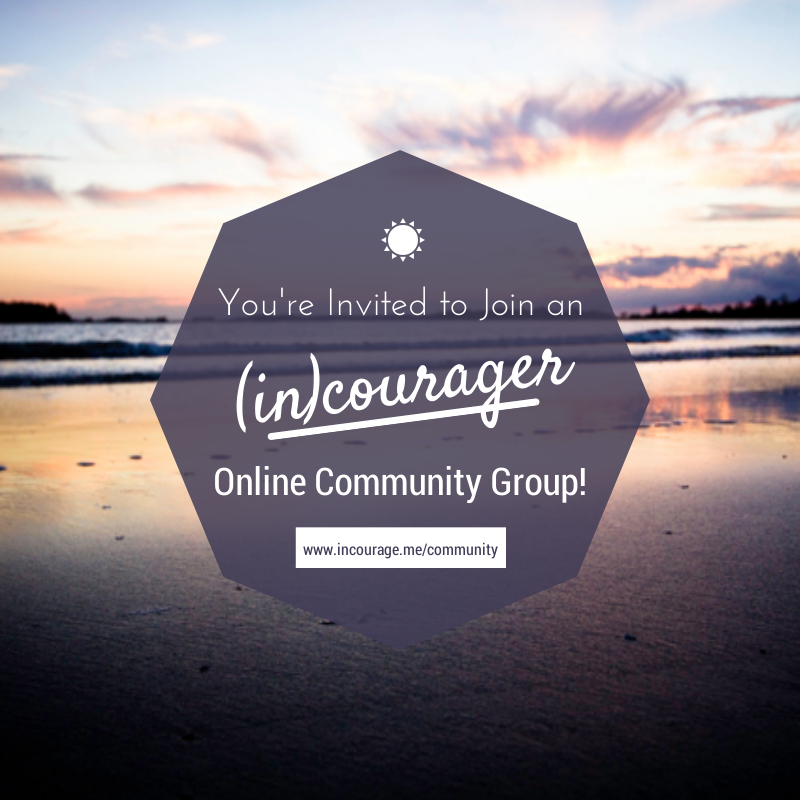 One day, I received an email from (in)Courage with the news that they were starting online (in)Courager groups and a link to go sign up. I hurried over and I found the Marriage and Mommyhood group. Through this group, I have met a very dear friend in California who shares my last name and her husband is even named Jon. And I learned that to encourage another woman, you don't have to be perfect- you have to be real. You can't be scared to share the hard parts, the gross parts, the funny parts, the great parts, and even the sad parts. Because what I have learned over the past 2 years is that woman just want to know that they are not alone. We want to know that there is someone else there who knows how we feel. And if that person is in an online group where you are safe to tell it all and know that you will have 30+ women praying for you and letting you know that you are not alone, then that's where you go. This is my 5th time with Marriage and Mommyhood and my 3rd time as one of it's leaders. I can't imagine not being in this group. But I also know that not everyone needs the Marriage and Mommyhood group. Maybe you are a dreamer and need a group for that, maybe you are an empty nester and need a group for that, and maybe you need a group for caregivers- guess what. With 70 groups- there is a group for you. Which means that there is someone who is praying for you today. That you will find the group that is the fit for you and that they will be able to encourage you. Because encouragement- that has become our super power. (in)Courage has given us that as leaders, as participants, and as women. This session will run from May 26 to July 4. I know that the women leading these groups have exciting things planned for everyone. So head over today through Friday and register for your group. You can go to http://www.incourage.me/community/incourager-groups to see all the groups and if you know you want to join the Marriage and Mommyhood group head to http://www.incourage.me/marriage-and-mommyhood and sign on up. Hope to see you there!